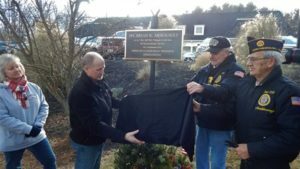 Northborough – On Saturday morning, Dec. 1, the air was crisp but calm as approximately 100 people gathered at the site of the soon-to-be Town Common on West Main Street to witness the unveiling of a plaque to honor the late Army Spc. Brian K. Arsenault. 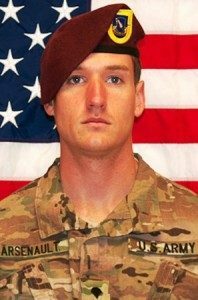 Arsenault, a 2004 Algonquin Regional High School (ARHS) graduate was killed in action in Ghazni, Afghanistan at age 28 in 2014. For his valor and service, he was awarded both the Bronze Star and the Purple Heart. Since his death, Northborough, led by the efforts in part from the Northborough American Legion Vincent F. Picard Post 234 and the grassroots nonprofit Boros Cares 4 Troops, has sought to ensure his sacrifice is never forgotten. That is something, his father Dan stressed, that his family very much appreciates. “Honoring, remembrance, heroism; he just represented all of these things and its very touching for us as a family and for me it just resonates with what I think he would want,” he added. Adam Costello, Veterans Program Coordinator at Easter Seals Massachusetts, and a close family friend of the Arsenault family, presided over the brief and informal unveiling. “It’s important to keep all of these folks in our hearts and our minds…We can do a little bit more than hopes and prayers, we really have to pay attention and we have to know what’s going on out there. If there is a way we support these folks in some way, it’s important that we do,” Costello said. The plaque was given by the Northborough American Legion Vincent F. Picard Post 234, which was represented by several of its members, including Bruce Goldsmith, Gerry Bourque and Ed Bombard. While a student at ARHS, Brian played on the hockey team. At the Dec. 1 ceremony members of the current team attended to honor his memory. Bourque shared that a formal dedication will take place on Memorial Day of next year. There are also plans to site a new Gulf War Memorial there as well. Leslie Arsenault, the mother of the late Brian K. Arsenault, is surrounded by members of the Algonquin Regional High School hockey team.